‘Never good enough’ is a parody on perfectionism, my topic in this month’s post. There are up- and downsides to being a perfectionist. Read why, and how to tell the difference. 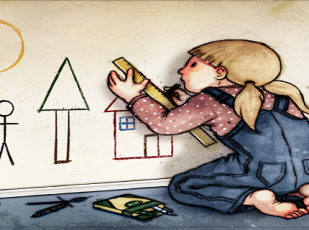 Describing someone as a perfectionist might sound like a compliment, but that’s not always the case. 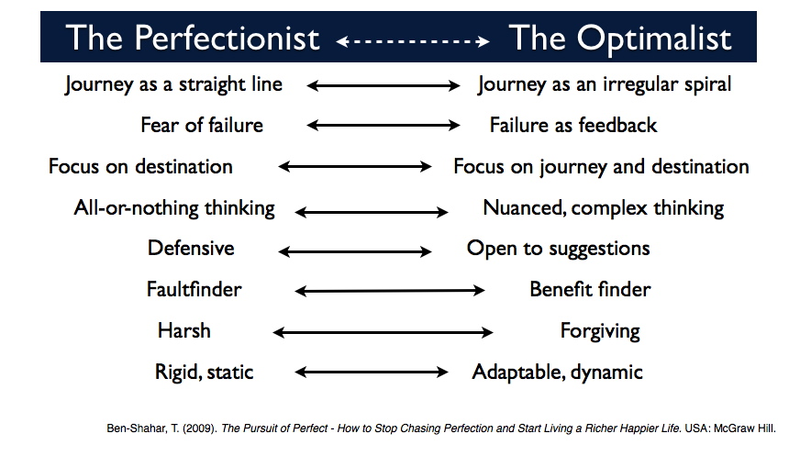 Perfectionism is often a cause of anxiety, broken relationships and sub-optimal performance. It is human nature to strive to do something as well as you possibly can. It uplifts your self-image and draws the attention – usually the admiration – of family, friends and peers at work. Dictionaries define perfectionism as a wish for everything to be correct. But there’s a dark side to being a perfectionist. Psychologist David Burns put it this way: “Reaching for the stars, perfectionists may end up clutching at air”. Perfectionism is a common character trait, found especially in intensely competitive environments, including those that emphasise status and achievement. I see it in people who have grown up in authoritarian households, where love is conditional and has to be earned. And in corporate cultures where wearing badges of honour for over-achieving are much sought after. One aspect of perfectionism is healthy. It drives you to achieve what you might ordinarily think is beyond you. Practice makes perfect, whether it’s your tennis serve or your command of an oral presentation. It pushes you into places you have tended to avoid, and motivates you to persevere in the face of seemingly daunting obstacles. But when perfectionism is taken to extreme, it extends into the neurotic and obsessive end of the spectrum, it debilitates. If you expect yourself to be flawless every time and are overly critical of your behaviour, perfectionism can lead you into paralysis and anxiety; even depression. Perfectionists, let their achievements define who they are. They experience deep unhappiness if they perceive they to not reach their goals. They get more stressed and more tired, more often than those who set more realistic goals to spur themselves forward. The irony is that the very fact of striving for perfection becomes a cause of failure. Achieving a hundred percent all of the time, is logically impossible. Striving for this degree of perfection is a certain recipe for failure; it can’t be attained. It only results in guilt, self-deprecation, anger, and frustration. Pushing relentlessly to succeed against insurmountable odds, denies perfectionists the ultimate enjoyment of reaching their goal. They can’t appreciate the journey if they are constantly worrying about their own self-imposed shortcomings. Perfectionism in these situations becomes counter-productive. It leads to procrastination and reluctance to get going. Perfectionists are constantly waiting for the right moment to get started, to deliver their best work. They get stuck in analysis paralysis, trap themselves in an endless focus on unimportant information and requisites, fall behind, let others down and a vicious cycle sets in. Another unhealthy facet of perfectionism is work alcoholism. Thinking ‘no pain, no gain’ leads to often-unreasonable expectations of self. While acknowledging that relentless standards are stressful, the perfectionist pushes on believing their efforts will lead to excellence and levels of productivity they would otherwise never attain. As a result, most of their effort is unwarranted and they become ineffectual. Many perfectionists struggle with black or white thinking – they don’t easily see shades of grey. The all-or-nothing mindset means they think in strict dichotomies such as ‘Success or Failure’. ‘Complete everything or Don’t do it at all’. One moment they are on top, celebrating success. The next they are in the depths of depression, castigating themselves for failing. Everything is an extreme. Perfectionists throw themselves into new challenges only if they believe they will succeed. In other words, they are risk-averse, and if there is a probability of failure, chances are they won’t even try. They avoid the challenge and its attendant opportunities altogether. This inhibits creativity, innovation and progress. This brings me to the difference between perfectionism and excellence. 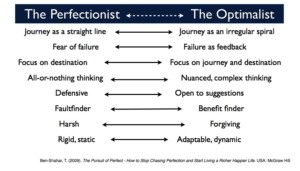 Psychologists refer to striving for positive perfectionism as optimalism or excellence, and negative perfectionism, which is maladaptive and neurotic. The optimalist accepts the constraints of reality and within these aims to be as good as they possibly can, that is excellent. This is healthy perfectionism, to be commended and a role model for others. In contrast, the perfectionist rejects those constraints and holds him- or herself responsible for succeeding in the face of them. Reality teaches us that no one succeeds without failing. It’s how you deal with failure and what you learn from failure that leads you to excellence. Unfortunately perfectionists inadvertently impose perfectionistic tendencies on others. ‘If I have to be perfect then you have to be perfect according to my standards’. Their unrealistic expectations of themselves lead to unrealistic expectations of others. No one succeeds in an attempt to control people and outcomes this way. The result is fractured relationships, disengaged and demotivated staff and a climate of fear, blame and low productivity. Everyone, including the organisation is set up to fail. The great irony of perfectionism is that while it is characterized by an intense drive to succeed, it is the very thing that prevents success. The first step to overcome perfectionism is to recognize it.